Is It Better To Mount Solar Panels On East Or West Roofs? Solar electric modules perform best when mounted on the south facing roof in every northern hemisphere location (not taking into account any shading issues). 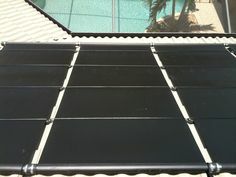 What happens if you do not have a south facing roof, or if you south facing roof is not suitable for solar? Southeast and southwest roofs are the next best options, but east and west facing roofs are not all that bad. 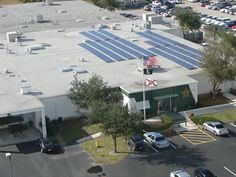 In fact, a tilted solar array facing east or west will only result in about 5-15% less energy produced here in Southwest Florida. But which is better? 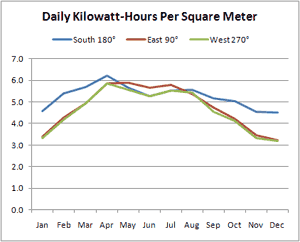 The tool that is commonly used to estimate solar electric output is called PVWATTS, which was developed by the U.S. National Renewable Energy Labs (NREL). We can enter a variety of variables to determine how much solar radiation to expect at a given location over the course of an average year. NREL uses historical hourly weather data, array orientation, temperature, and other factors to determine the expected system performance. 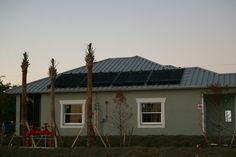 If we run a PVWATTS calculation for Southwest Florida for a hypothetical solar array tilted at 25 degrees (about a 6 in 12 roof), the total average annual radiation per day is 5.26 kilowatt-hours per square meter for a south facing array. The east and west averages are 4.73 and 4.61, respectively. The production losses are 10.0% and 12.4%, respectively. The winner is east! Let’s delve into the numbers just a bit to find out why. The chart on the right shows that east and west production are virtually identical from January – April and August – December. However, May – July shows better results for the east facing array. In fact, the east facing array beats the south array in the summer! It’s not immediately obvious why this phenomenon exists, but if you dig into the hourly output, there are some clues. Two important factors come into play – weather and temperature. In the summer Southwest Florida gets pretty routine afternoon thunderstorms. These thunderstorm occur when the sun is in the western sky at the time that the west facing solar modules should be performing optimally. Generally the mornings have sunny weather, benefiting the east facing array. In addition, temperatures at mid-day and in the afternoon are generally much warmer than in the morning. Solar electric modules lose performance in high temperatures (we’ll save the “why” for another blog entry). Finally, the mid-day sun is almost directly overhead in summer in Southwest Florida, so in this particular example with a 25 degree array tilt, east beats south in May – July. So if you are asking whether to mount solar panels on the east or west roof, it doesn’t make a huge difference, but east trumps west by a slight margin.